Sacrifices in the Mellinial Kingdom? Recently the question of sacrifices in the Millennial Kingdom has come up. The question for Christians is, “Why would there be sacrifices if Yehoshua (Jesus) was the final ‘once and for all sacrifice? '” It is troubling for many to reconcile this. In fact, certain anti-missionary groups have used this very topic to destroy the faith of Christians. Thankfully, there are a couple of potential answers that address this issue. The first deals with gaining understanding in regards to what the sacrificial system was for. We have the idea somewhat built into our religious culture, that the God of the OT (as if He was a different God than the one we now serve) needed the blood of animals in order to be appeased. Meaning, if we offered Him the blood of animals or the smell of their burning flesh that His anger would be turned away from us and somehow this made our wrong, right. What we fail to see when we take this position is that we have just described a truly pagan god. YHWH is not some angry OAF, an ogre of a god that needs to be appeased. He is an all-knowing God of love who does not change. What He is today He always has been, yet all too often we read the Tanach (OT) as if He operated under a different set of characteristics back then. God does not change! The sacrificial system did not appease an angry god, nor did it ever completely deal with the issue of death and decay that resulted from sin. What the sacrificial system was always doing, was POINTING forward to the one who could deal with these things. Hebrews 9:12 neither by the blood of goats and calves, but by his own blood he entered in once into the holy place, having obtained eternal redemption for us. (13) For if the blood of bulls and of goats, and the ashes of a heifer sprinkling the unclean, sanctified to the purifying of the flesh: (14) how much more shall the blood of Messiah, who through the eternal Spirit offered himself without spot to God, purge your conscience from dead works to serve the living God? He did the true work, and the sacrificial system was always pointing at that work. Even in the Feasts we see a pointing to Him. The Yom Kippur sacrifice, for example, symbolically placed the sin of Israel onto the back of a goat (Lev. 16:8-10) and sent it out into the wilderness where it would be “released.” This is a painting, a picture of the work Yehoshua was to do as animals, again, do not substitute they POINT. And this is MY point, that if the sacrifices begin again in the Millennial Kingdom, they will still simply be pointing. Whether they once pointed forward to work that would be done or backward at work already done, they are just pointing. And why would God allow this, use this? In the Millennial Kingdom not everyone will have been changed (perfected), in fact, I dare say the majority won’t have been. Revelation 20:7-8 speaks of the Adversary being let loose out of his prison to deceive the nations again. From this we can determine a few things. The first being, there will still be nations. Secondly, there will be people alive who can still be deceived and that is significant seeing it is at Messiah’s return that he makes those who are his, “incorruptible.” If we are made incorruptible, we can’t be deceived. Somebody has to be alive who can be! So I believe that the sacrifices will be used during the Millennial Kingdom to TEACH the nations who do not know Messiah. The second answer dealing with the apparent conflict between Yehoshua being the final “once and for all” sacrifice and the coming Millennial Kingdom sacrifices is one which has to be given with something of a disclaimer. I am warning you now, what I am about to share caused some inner turmoil in me when I first heard it. We are all somewhat emotionally attached to the very thing I am about to appear opposed to, so I ask that you hear me out completely first. Scripture often uses abstract language. God, Heaven, the Kingdom, certain works or attributes of God…often come to us in abstract pictures which depict something literal while the picture itself remains metaphoric or analogous. For example: 2 Sam 22:2 and he said: The LORD is my rock, and my fortress, and my deliverer; Does this mean that when we see Masada (the great fortress built on a rock plateau near the Dead Sea in Israel) or take a trip to India to see the great fortress Janjira that we are looking at God? Of course not, “rock” and “fortress” are being used abstractly in 2 Samuel to depict characteristics of God. He isn’t a rock, He is not a fortress but both things carry traits that remind of us Him. Now there are many more examples, but for brevity sake I want to skip forward to Yehoshua. He is called “The lamb of God.” My question is, “Is Yehoshua a lamb?” The answer is no…he lacks fur, 4 legs, and a tail. He is called a lamb because of the manner in which a lamb will give itself to its owner. If you have ever seen a lamb taken to slaughter, you will completely understand my last statement. A lamb goes willingly and quietly and that picture was found in the actions of Yehoshua, thus him being called a lamb. The word “lamb” is a metaphor, but being a metaphor does NOT take away from HIS WORK!!! In fact, when you understand the picture the metaphor is intended to deliver, it DEEPENS his work and makes it more meaningful, we get a better picture and a better understanding of it because of the metaphor used to depict the work. That brings me to the word sacrifice. Is that word meant to be taken literally, or is the word used abstractly? Is it possible that the language surrounding the sacrificial system is used by Paul to make a connection between the pictures they drew of work to come, and Messiah’s actual work? A sin sacrifice according to Torah, was, depending on the type of sin offering, a bull, goat, or dove. “Generally” the animal would be butchered with its blood collected and sprinkled on the outer corners of the Altar. The animal would be cut and quartered with its organs burnt on the roof of the Altar and the flesh, it has been interpreted, would be eaten by priests as one of the 24 priestly gifts. Now, did any of this happen to Yehoshua? Did he have his throat slit? Was his blood collected and sprinkled on the corners of the Altar? Was he cut and quartered with his fat, liver, and kidneys burned on the Altar roof? Was he later eaten? The answers to these questions are obviously no. And yet, there is more! Deuteronomy 12:31 you shall not do so to YHWH your God; for everything hateful to YHWH, which He detests, they have done to their gods. For they have even burned their sons and their daughters in the fire to their gods. I don’t know about you, but to me this verse has God calling human sacrifice an abomination. And if God considered human sacrifice an abomination when it comes to Ba’al or Molech or any other pagan god, then why would we think He would accept the same unto Himself? This is not an issue though, if we understand that the language of the sacrificial system was used in a manner meant to depict the work of the one who could overturn the curse of sin and death, then this should only serve to enhance our understanding of the work of Yehoshua. He gave of himself, he sacrificed himself, but he was not a literal sacrifice as depicted in Torah, rather, the literal sacrifices found in Torah were pictures of that which was to come (Him and his work!). Romans 5:17 For if by one man’s offense death reigned by one, how much more they who receive abundance of grace and the gift of righteousness shall reign in life by One, Yeshua Messiah. (18) Therefore as by one offense sentence came on all men to condemnation, even so by the righteousness of One the free gift came to all men to justification of life. (19) For as by one man’s disobedience many were made sinners, so by the obedience of One shall many be made righteous. (20) But the Law entered so that the offense might abound. But where sin abounded, grace did much more abound, (21) so that as sin has reigned to death, even so grace might reign through righteousness to eternal life by Yeshua Messiah our Lord. The sacrificial system pointed at this work, at the reversal of the curse. It was the type, Yehoshua’s work is the anti-type, that which the type pointed to. The anti-type is superior because it is that which we desire, we don’t want the picture; it is the real thing we all desire. So if sacrifices are part of the Millennial Kingdom, which they appear to be, they should not cause us to recoil and panic, or have our faith shaken. Rather, we need only understand what they once depicted in order to understand how they will be used again in the future. We also must put into account that the Priesthood that did not have an alloted inheritance of land, ate of the offerings and shared the offerings that were made for YHVH. Many often forget this fact. It is no different than having an anniversery meal with your Spouse, you share of the same meal. One of the reasons that the offerings will continue is that the Priesthood of the Mellinium will be fed by them, and will be partakers of the offerings just as they always have. The tithes also helped feed the poor, widow, and Orphans as well. Everything in YHVH’s instructions fulfill the needs of His people and His Provisions are perfect, if we would only leave the mindset of sacrificing to appease Him as the Author states, we could truly begin to understand the Love Yah has for His People, and the special blessings he has in store for His Faithful Sons of Zadok. But the priests the Levites, the Sons of Zadok, that kept the charge of my sanctuary when the children of Israel went astray from me, they shall come near to me to minister unto me, and they shall stand before me to offer unto me the fat and the blood, saith the Lord GOD: 16.They shall enter into my sanctuary, and they shall come near to my table, to minister unto me, and they shall keep my charge. 17. And it shall come to pass, that when they enter in at the gates of the inner court, they shall be clothed with linen garments; and no wool shall come upon them, whiles they minister in the gates of the inner court, and within. 18. They shall have linen bonnets upon their heads, and shall have linen breeches upon their loins; they shall not gird themselves with any thing that causeth sweat. 19. And when they go forth into the utter court, even into the utter court to the people, they shall put off their garments wherein they ministered, and lay them in the holy chambers, and they shall put on other garments; and they shall not sanctify the people with their garments. 20. Neither shall they shave their heads, nor suffer their locks to grow long; they shall only poll their heads. 21. Neither shall any priest drink wine, when they enter into the inner court. 22. Neither shall they take for their wives a widow, nor her that is put away: but they shall take maidens of the seed of the house of Israel, or a widow that had a priest before. 23. And they shall teach my people the difference between the holy and profane, and cause them to discern between the unclean and the clean. 24. And in controversy they shall stand in judgment; and they shall judge it according to my judgments: and they shall keep my laws and my statutes in all mine assemblies; and they shall hallow my sabbaths. 25. And they shall come at no dead person to defile themselves: but for father, or for mother, or for son, or for daughter, for brother, or for sister that hath had no husband, they may defile themselves. 26. And after he is cleansed, they shall reckon unto him seven days. 27. And in the day that he goeth into the sanctuary, unto the inner court, to minister in the sanctuary, he shall offer his sin offering, saith the Lord GOD. 28. And it shall be unto them for an inheritance: I am their inheritance: and ye shall give them no possession in Israel: I am their possession. 29. They shall eat the meat offering, and the sin offering, and the trespass offering; and every dedicated thing in Israel shall be theirs. 30. And the first of all the firstfruits of all things, and every oblation of all, of every sort of your oblations shall be the priest’s: ye shall also give unto the priest the first of your dough, that he may cause the blessing to rest in thine house. 31. The priests shall not eat of any thing that is dead of itself, or torn, whether it be fowl or beast. This is in allignment of the Prophecies and Promises we find for them that overcome in the Book of Revelation. 13..And one of the elders answered, saying unto me, What are these which are arrayed in white robes? and whence came they? 14. And I said unto him, Sir, thou knowest. And he said to me, These are they which came out of great tribulation, and have washed their robes, and made them white in the blood of the Lamb. 15. Therefore are they before the throne of God, and serve him day and night in his temple: and he that sitteth on the throne shall dwell among them. 16. They shall hunger no more, neither thirst any more; neither shall the sun light on them, nor any heat. 17. For the Lamb which is in the midst of the throne shall feed them, and shall lead them unto living fountains of waters: and God shall wipe away all tears from their eyes. Let us all come into knowledge and show YHVH’s Word the Love he has shown us. No longer should we shun beautiful things because our culture has taught us they are taboo or “outdated”. Societies change but YHVH does not, may His Truth stand firm for ever and ever, HaShem Yahoshua, Amein Amein! Excellent post and additional insights!! Thanks. This has been a topic in a recent discussion/debate I have been drawn into. Keep up the good work. I enjoy the blog. There will not be a second chance for salvation at any time at all after the Milennium begins….no 100 years and no further mercy from the Lord …they have had time to accept Salavtion before….for at this time it is the Judgement of ALL with the Great White Throne Judgement. So no need for animal sacrifices to show the unsaved that Jesus was the ultimate sacrifice …..because they will be forever without HIM…..they have chosen their lot. Paul continued Animal Offerings long after his conversion, as Yeshua said, not one jot or tittle will be removed from the law till heaven and earth passes. Act 24:14 However, I admit to you that in accordance with the Way, which they call a heresy, I worship the God of our ancestors and believe in everything written in the Law and the Prophets. Act 24:15 I have the same hope in God that they themselves cherish-that there is to be a resurrection of the righteous and the wicked. Act 24:16 Therefore, I always do my best to have a clear conscience in the sight of God and people. Act 24:17 After many years I have come back to my people to bring gifts for the poor and to offer sacrifices. 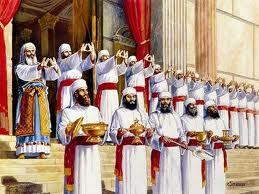 Act 24:18 They found me in the temple doing these things just as I had completed the purification ceremony. No crowd or noisy mob was present. Richard, the Millennial reign is not the end of the story. It is the final stage of Yeshua’s redemption of the earth, fulfilling many prophecies. The White Throne judgment does not happen until AFTER the Millennium. See Revelation 20. The Adversary is bound at the beginning of the 1000 years. The judgment in v. 4 is only for those who were martyred during the Great Tribulation. V. 5 explicitly says, ‘The rest of the dead did NOT come to life until the 1000 years were completed.’ Vss. 11 and following are the Great White Throne judgment… after the Millennial reign. Other passages support this: Zechariah 14:16-21 demonstrates there will be those who choose not to be obedient and they are disciplined. It is during this time that Isaiah 2:1-5 and Micah 4:1-7 will be fulfilled with a major mark being the fact that Torah will be taught from Zion. This indicates several things… 1. We still need instruction in righteousness, 2. There are those who have not bowed… yet, and 3. Rev. 20:7-9 demonstrates that even in the King’s presence, there will be those with rebellious hearts. Further, during the 1000 years, there will be marriage, children, new generations needing the Mashiach… etc. Concerning Animal Offerings, according to Ezekiel 4–48, which is the Mellinial Temple, it describes in detail all the different animal offerings that will be done. To take away animal; sacrifices is to do away with the Inheritance of the Levites. The Levites and Priests eat and live off of the offerings given at the Temple, and the promised inheritance for the Levites would be that they partake in His offerings. Paul, lomg after he converted offered animal offerings at the Temple. Act 24:14 However, I(Paul) admit to you that in accordance with the Way, which they call a heresy, I worship the God of our ancestors and believe in everything written in the Law and the Prophets. Excellent thoughts and insights! Sacrifice in the Millennium is a sensitive subject only when we are not willing to sit down and let the Word of Yahweh instruct. As long as we submit ourselves to church doctrines, the ‘traditions of men,’ we will lack wisdom and understanding. I highly recommend this article. Thanks Pete for the great points.